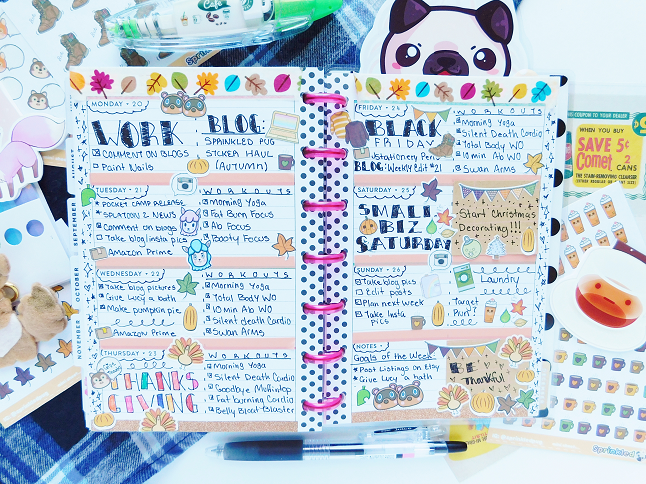 After my Blogtober planner spreads, I decided to take a break from planners spreads because I didn't want to annoy with you guys with an abundant amount of planner post but I did want to share a least one autumn spread before the Blogmas posts start. 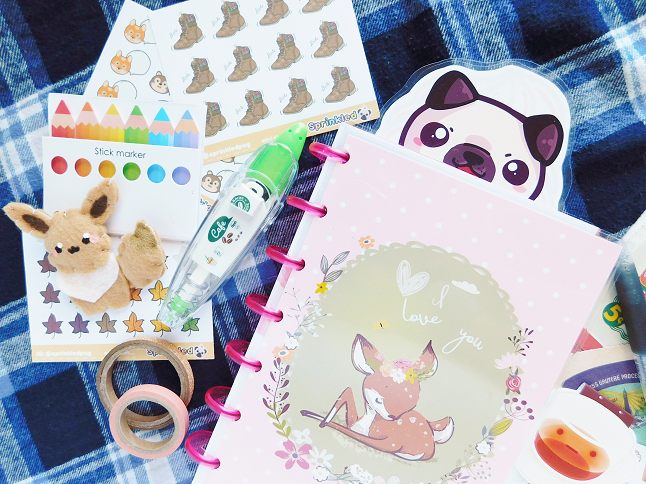 Yay for Christmas stationery posts! 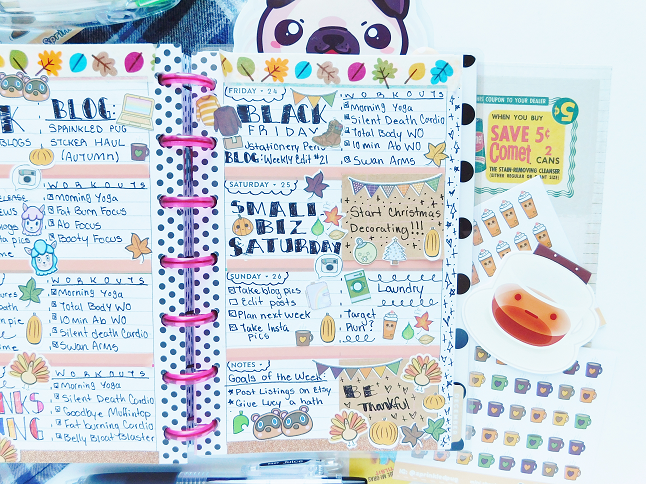 Sadly, this will probably be the last spread in my mini Happy Planner because over the Black Friday/Cyber Monday weekend I finally bought the Everyday Essentials Medium Happy planner that I wanted! When I saw this planner earlier this year I knew I needed it in my life but it was sold out in stores and I didn't want to buy it online because I didn't want to pay for the shipping so I waited and waited and was finally able to buy it online and on sale! Hopefully, it arrives before December so I can start decorating with Christmas stickers. I was surprised to find out that I didn't have any autumn washi tape left from last year, guess I used it all. I had to go back from a previous year and scrape up washi to use as a header. In the center, I used a pastel orange thin washi tape and at the bottom, I used the light orange glitter washi that I mentioned in my Target stationery haul. Since Animal Crossing: Pocket Camp was released this week I used my Animal Crossing stickers! 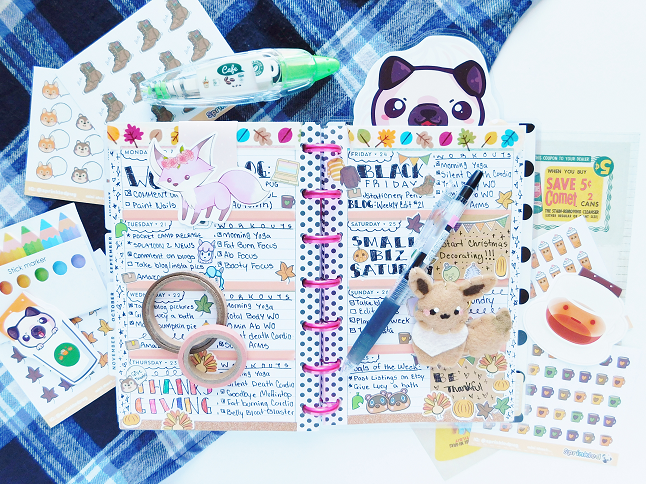 Most of the stickers in this spread are from Sprinkled Pug but I also used some stickers from Oh So Fawn that I had laying around from a mystery bundle. 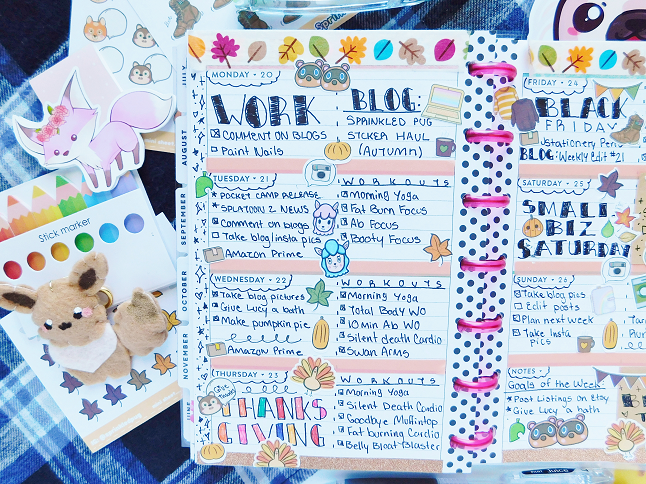 This week I turned my notes section into my goals for the week (one which I wasn't able to accomplish) since I never know what to do with this section so I like to try new things, I love the idea of weekly goals section. I also used some scrap notepad paper and snip it to cover the weekly box and messy areas.